2-3lbs of boneless skinless chicken. I used thighs but breast will work just fine. Mix your pineapple juice, brown sugar and soy sauce until brown sugar is dissolved. 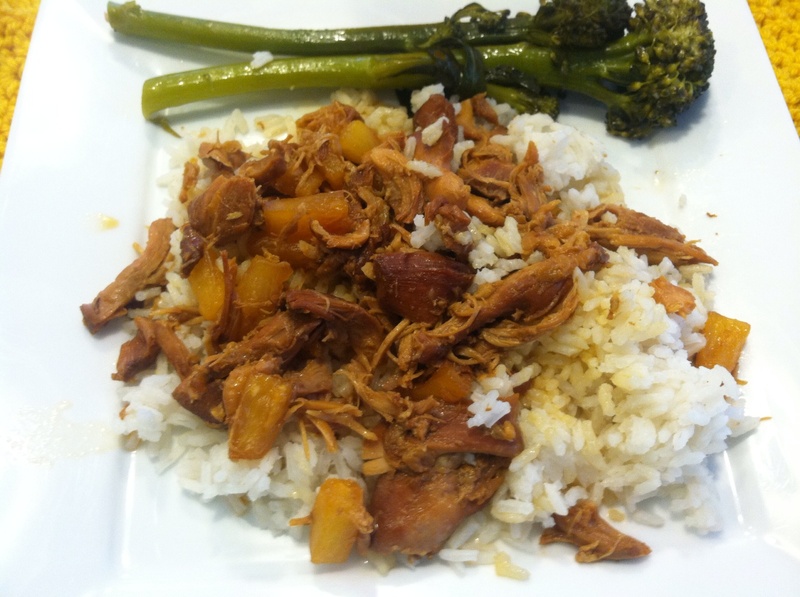 Dump your chicken and the pineapple juice mixture in your crockpot. During the last hour of cooking- remove the crockpot lid and turn crockpot to high to let sauce thicken a bit. If you want during the last 20 minutes toss in pineapple. When it is done the chicken will be falling apart and your house will smell amazing! This entry was posted in Recipes and tagged CaseinFree, Chicken, Cooking, Crock Pot, Dinner, Easy, GFCFdiet, GFdiet, GlutenFree, Hawaiian, Kid Friendly, Pineapple, Recipes. Bookmark the permalink. This brings back memories! My dad and I made a similar dish when I was growing up. As I recall we also added water chestnuts for crunch and of course the pineapple chunks. There may have been a little orange juice, too, rather than brown sugar. Must see if I can recreate this again. Thanks for posting!